When the NYPD decided earlier this month to move ahead with its departmental trial against two officers involved in the 2014 death of Staten Island resident Eric Garner, it tasked the Civilian Complaint Review Board, an independent watchdog agency, with prosecuting the charges. But that prosecutorial authority has yet to be codified into the City Charter, the city’s central governing document, a change that CCRB officials are seeking through Mayor Bill de Blasio’s charter revision commission. In testimony last week before the charter revision commission, which will propose charter amendments to voters on the November Election Day ballot, the CCRB’s executive director, Jonathan Darche, urged commission members to consider expanding the board’s powers and solidifying its place in the city’s constitution. A 13-member body composed entirely of civilians, the CCRB investigates, and prosecutes, allegations of police misconduct, including complaints about use of force and abuse of power. The current iteration of the agency dates back to 1993 when the body was given subpoena power and the ability to make disciplinary recommendations after substantiating complaints against police officers. It was the CCRB last year that substantiated the complaints against Daniel Pantaleo, the NYPD officer who held Eric Garner in a banned chokehold that led to his death. The CCRB recommended the highest possible penalty it can against Pantaleo -- charges and specifications, which are then prosecuted by CCRB lawyers in an administrative trial. Ultimately, the CCRB issues its recommendations to the police commissioner, who makes the final determination on a disciplinary proceeding. With the mayor’s charter revision commission close to concluding its work and announcing its proposals in early September, Darche testified at one of the commission’s hearings across the boroughs, on July 26 in Queens. Darche’s testimony follows on a letter sent by the CCRB to the charter commission in May, which enumerated the four proposed changes, which include codifying the Board’s Administrative Prosecution Unit (APU), which is handling the Pantaleo trial; enabling the board to give subpoena signatory power to the agency’s highest ranking staff; clarifying and expanding the NYPD’s duty to cooperate with CCRB requests for documentation and data; and amending the agency’s budget to equal one percent of the NYPD’s budget. Eric Phillips, a spokesperson for the mayor, declined to comment for this article. The NYPD did not respond to emails seeking comment. When Mayor de Blasio announced the charter revision commission in February he said he wanted it to focus on election and campaign finance reform, but it has heard testimony on a wide range of matters and is considering, as is its right, focus areas beyond the mayoral mandate. The most significant proposal put forward by the CCRB relates to the Administrative Prosecution Unit, which was created in 2012 under Mayor Michael Bloomberg through a Memorandum of Understanding (MOU) with the NYPD. As is the case with Pantaleo, the APU handles prosecutions in cases with the strongest disciplinary recommendation. According to the CCRB, the unit has prosecuted officers in 367 trials since its creation. Carolyn Martinez-Class, a spokesperson for Communities United for Police Reform, a broad coalition of police reform advocates, welcomed the CCRB recommendations as “important initial proposals to improve police accountability and transparency generally,” in a statement to Gotham Gazette. “In order to be effective, the proposed change to codify the Administrative Prosecution Unit must also codify the original MOU's intent to make transparent instances when the Police Commissioner disagrees with CCRB recommendations so that those instances and rationale are made public as originally intended,” she added. Though the commission members asked no questions of Darche at the hearing in Queens, and police oversight has not been one of the main issues the commission is exploring, Darche will have another opportunity to push those proposals. The mayor’s commission is expected to put out its final report within weeks and will propose ballot measures for the November general election, but the New York City Council has created a separate charter revision commission, which convened for the first time earlier this month. That second commission -- which includes commissioners appointed by the mayor, comptroller, public advocate, City Council, and borough presidents -- is working with a longer timeline, aiming to put its proposals on the ballot in November 2019, allowing it ample time for a more holistic review of the charter. City Council Member Donovan Richards, chair of the public safety committee, said in a statement that he was “absolutely in support” of the CCRB’s proposals to the charter commission. 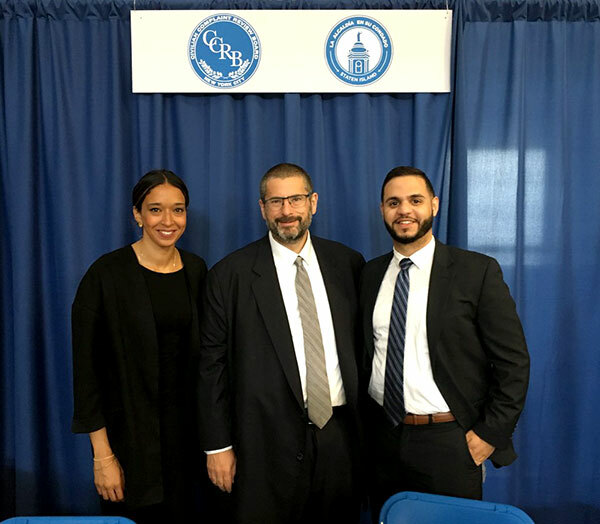 “Increased transparency and accountability are essential to improving police-community relations and the CCRB should absolutely have a stronger presence in that process moving forward,” he said.